They offer a full range of accommodation and sites to suit families, groups and individuals. 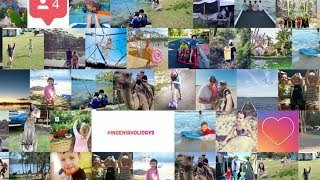 The minute you arrive your holiday begins at Ingenia Holidays Cairns Coconut Resort. A tour in their "Nemo", "Turtle" or "Frog" buggy introduces you to the many exciting, free facilities and activities. These include the all-weather Mini Coconuts Playground, Neos Interactive Play Hub, heated Splash Waterpark, two giant jumping pillows and huge playground. Your children will be entertained while you relax. Coconut Condos are large and spacious and suitable for larger families or groups. The main bedroom has a queen bed, ensuite bathroom and opens onto the spacious patio. There is a queen bed in the second bedroom, two double bunks in the third bedroom and a spa bath in the second bathroom. Facilities include a full kitchen with large fridge including microwave and dishwasher, two colour televisions, air-conditioning, Austar (ten channels), laundry and a barbecue and outdoor setting on the patio. Undercover parking completes this excellent family accommodation. Sleeps up to eight. All linen included. Ideally situated adjacent to the wonderful Sun Lagoon Pool and are their top of the range accommodation. The main bedroom has a queen bed, ensuite bathroom and opens onto the spacious patio. There is a queen bed in the second bedroom, two double bunks in the third bedroom and a spa bath in the second bathroom. Self-Contained Holiday Units are ideally situated opposite the resort pool. The main bedroom has a queen sized bed and the living area has a single bed, a pull out mattress and a sofa bed. Large ensuite with shower, toilet and vanity. Please note: floor plan may differ. Bathroom may lead off lounge or bedroom. Facilities include microwave, hotplates, electric frying pan, jug, toaster, refrigerator, split system air-conditioning and colour television. Patio with outdoor setting and undercover parking make these newly refurbished units excellent value for money. Sleeps up to six. Linen and bath towels provided. Perfect for families or couples - Ensuite Cabins provide comfortable accommodation and are extremely popular. Featuring a queen bed with bunks and a pull out mattress. All ensuite cabins include a shower, toilet and vanity. Facilities include microwave, hotplate, electric frypan, jug, toaster, refrigerator, air conditioning and digital television. Patio with outdoor setting and adjacent parking. Sleeps up to five people. Linen is included. This accommodation features two bedrooms with bathroom, vanity and toilet. Linen and bath towels are included. Facilities include a full kitchen with large fridge, microwave, oven and cooktop, two televisions, split system airconditioning, spacious patio with barbecue and outdoor setting with undercover parking. Perfect for families - the two bedroom option offers a queen bed in the main bedroom, a set of bunks in the second bedroom and a fold out sofa bed in the lounge. This accommodation features a spa bathroom with mood lighting, vanity and toilet. Linen and bath towels are included. Facilities include a full kitchen with large fridge, microwave, oven and cooktop, two colour televisions, split system airconditioning, Austar television (ten channels), spacious patio and outdoor setting with undercover parking. Please note floor plan differs between one and two bedroom styles with one bedroom sleeping five people and two bedroom sleeping six people. Perfect for families - surrounded by a mountain backdrop, the One Bedroom Spa Villas have a queen bed in the main bedroom and a single over a double bunk in the lounge room. This accommodation features a spa bathroom with mood lighting, vanity and toilet. Linen and bath towels are included. Facilities include a full kitchen with large fridge, microwave, oven and cooktop, two colour televisions, split system airconditioning, Austar television (ten channels), spacious patio and outdoor setting with undercover parking. Villas are a family favourite with a queen bed in the main bedroom and a single bed and bunk set, or two sets of bunks in the second bedroom. Facilities include a full kitchen with large fridge, either a convection microwave oven or a oven with cooktop and microwave, two colour televisions, air-conditioning and Austar (ten channels). Modern and spacious their huge Luxury Villas are sure to please. The main bedroom has a queen bed with LCD television. There are two sets of bunks in the second bedroom and a fold out sofa bed in the lounge. The two way bathroom has a built in laundry and the toilet is separate. Linen and bath towels are included. Full kitchen including dishwasher, convection microwave oven and large fridge, two colour televisions, Austar (ten channels), air-conditioning, private barbecue and outdoor setting on the patio. Adjacent parking. Sleeps up to eight. Airy and bright, these two bathroom Luxury Villas are perfectly located overlooking the Sun lagoon Pool. The main bedroom has a king bed with an LCD television and an ensuite bathroom which has a built in laundry. In the spacious second bedroom there are two sets of double bunks and a fold out sofa bed in the lounge. All linen and bath towels are included. Modern full kitchen including dishwasher, convection microwave oven and large fridge. Facilities include large LCD colour televisions, Austar (ten channels), split system air-conditioning, private barbecue and outdoor setting on the patio. Adjacent parking. Sleeps up to eight. 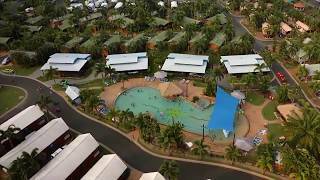 Tropical Ensuite Cabins are situated closest to the Kidz Adventureland and the day/night tennis court. Built mid 2001 these tastefully appointed cabins are ideal for couples or young families. The open plan living with comfortable queen bed is separated from the living area by a privacy curtain, plus full size bunks with a pull out mattress. Modern ensuite with roomy shower, toilet and vanity. All linen and bath towels included. Facilities include microwave, hotplates, jug, toaster, electric frying pan, fridge, split system air-conditioning and colour television. Spacious patio and adjacent parking. Sleeps up to five. Acres of large, grassy, shady sites, close to spotlessly clean amenities and huge, well appointed campers kitchen. Family bathroom and accessible bathroom are available for use. All have water connection and come powered or unpowered. Caravan and camper luxury - treat yourself to luxury while enjoying the comfort of your own caravan or camper trailer on a double sized site which has the convenience of your own laundry facilities and private barbeque. Inside the very spacious ensuite there is a spa bath, shower, vanity and toilet. Ensuite sites have a spacious ensuite with shower, toilet and vanity. One disabled ensuite site available for use. These large and shady sites have a concrete slab, water, power and sullage outlet. Close to amenities, large and shady with concrete slab, water, power, sullage and sewerage outlets. A separate family bathroom with shower, toilet, bath and baby facilities along with an Australian standard designed disabled bathroom are available for use. Acres of large, grassy, shady sites, close to spotlessly clean amenities and huge, well appointed campers kitchen. Family bathroom and disabled bathroom are available for use. All with power and water and some with sullage outlets.